The O2Surf, weatherproof WiFi Access point, bridge, client from RadioLabs! 802.11 B/G/N – 150MBPS Bridge, outdoor wifi Access Point, Repeater, Client – The only WiFi tool you need! The Best High Power, low-cost outdoor wifi radio made. 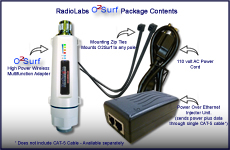 The o2Surf, is a new member to the RadioLabs family of cutting edge wireless equipment. With robust features, the o2Surf is the all-in-one outdoor wifi device designed to solve many of the networking issues individuals and companies face today. This high power, Outdoor WiFi access point/client/bridge/repeater, has it’s own integrated N-Male antenna connector. 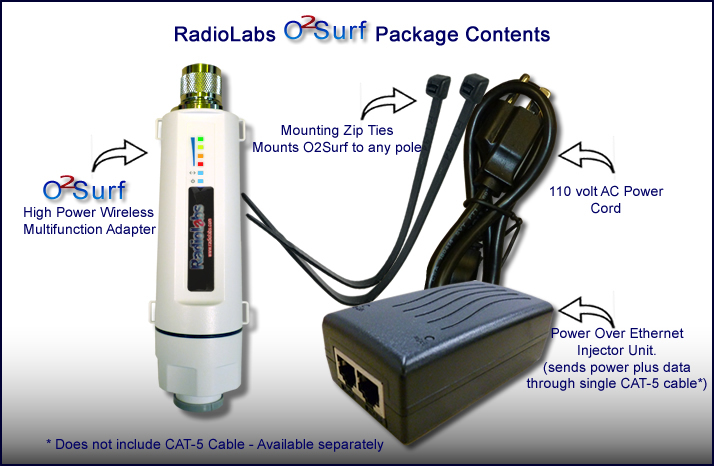 The o2Surf radio, connects directly to any 2.4ghz antenna offered by RadioLabs. Simply select an Omni Directional WiFi Antenna, or a Directional Wifi Antenna from our online catalog, which we have universally matched our antenna connectors, so any N-Female cable or antenna will screw directly onto the 02Surf’s wifi connector. Furthermore, in the instances that a coax cable is necessary, users can deploy their equipment with the confidence that signal loss will be minimal. This means optimal speeds, increased stability, and extended coverage of their wireless networks. 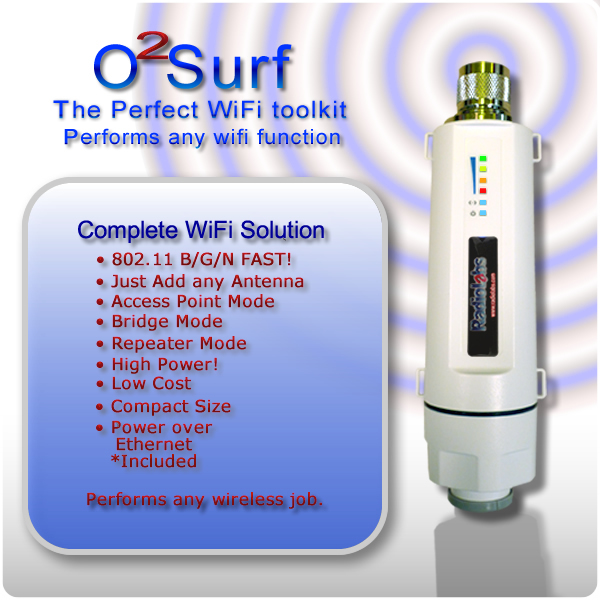 Access Point Mode: The o2Surf, is designed to work as a high speed, high power outdoor wifi Access Point. It is suitable for RV Parks, Farms, Home internet, Marinas, Parks and Recreation, Zoos, Large Scale deployment of public wifi or anywhere you need to install access over a broad open area. The features in the o2Surf radio, are perfect for use where dozens of wifi enabled devices need to connect and pass traffic through the network at high speed. The receiver sensitivity is excellent, for receiving low power devices, and allow for distant connection to weak wireless devices. Our WDS + Access Point mode, allow for small to medium size point to point, or point to multipoint operation, where repeaters or dedicated clients can seamlessly and permanently connect to the o2Surf radio. The o2Surf can also act as a Wifi Router and Access point, and a simple incoming internet connection can plug in. The o2Surf can then be programmed to operate as a WAN gateway, and issue IP Addresses to all devices on the network. Access Point Mode, where your device creates its own powerful, secure wireless network by simply connecting to one of the LAN ports on your existing router. Bridge Mode, in which two of the devices are used to form a seamless point to point link at a distance of several miles (using properly aimed directional antennas). The o2Surf can even be used as a router, with the proper configuration. Client Router Mode: This is a brilliant mode, which allows the o2Surf to connect to ANY access point, on any local IP Address, such as public hotspot or gateway, xFinity Hotspot, Verizon Hotspot, or literally any network, and the o2Surf acts like a single computer connecting to the system. Then, in a brilliant pass-through mode, the o2Surf receives an incoming IP address from the public hotspot, then turns around and starts passing out it’s own privatized IP Addresses, acting like a simultaneous client and router. This amazing new Client / Router mode built into the o2Surf, is perfect for permanent connection to xFinity or similar hotspots, where you want to use one of our high power routers to connect all your devices, yet maintain a permanent gateway to the internet. RadioLabs offers full kits utilizing this mode, and have hundreds, if not thousands of customers connect to public hotspots using this amazing new mode. Client Router mode, can also be used to permanently connect to any wifi connection, then re-issue your own private, firewalled gateway, capturing the internet, then completely and securely privatizing your own internet. Call us if you have any questions about using this mode in any application. Repeater Mode: is a special operation mode which allows the o2Surf to seamlessly receive and rebroadcast any o2Surf or RadioLabs outdoor Access Point product and rebroadcast it with another broadcast signal name (SSID) or with the same SSID. This all happens in a special mode called “WDS Repeater Mode” setting, and is quite seamless across our entire outdoor wireless product line. power up the device and connect it to your computer, login and make the necessary changes, and your network will be up and running in no time. 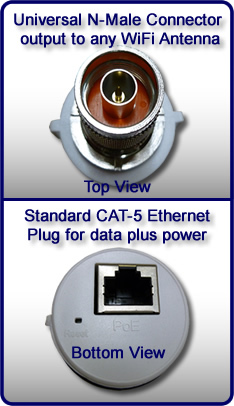 Due to the O2 Surf being powered via POE (Power-Over-Ethernet), you don’t even need to run a power supply to the bridge, just use the included power injector and your bridge has power and data transmitted over CAT-5 cabling! Plus, with its robust, weatherproof casing designed to withstand the harshest of outdoor elements, the O2 Surf is the perfect solution for almost any networking solution. ust add an antenna and ethernet cable! This is the only outdoor wireless tool you need to perform virtually any wifi task. With a simple mode change, the O2Surf can be changed to a bridge, to link two buildings for internet for miles around, a repeater to light up any RV Park, Marina, Camp, or literally saturate any area in wifi. They can repeat, or “daisy chain” together, to form a network of almost unlimited size, while retaining low overhead and FAST speed. Most sensitive chipset in it’s class. Output power is no longer critical because O2Surf uses one of the most sensitive receiver chipsets on the market! 150+Mbps real TCP/IP throughput traffic at 802.11 B, G or N speeds. Selectable via software interface. Weather-proof and powered via POE (Power Over Ethernet). Run power plus data up to 330 feet from it’s power source. Updated simple and intuitive user interface for effortless navigation. Easy configuration modes, make programming simple. Easy user manuals allow for step by step programming to easily setup your O2Surf to connect, repeat, or virtually any wireless function imaginable. No more looking for what device to buy, the O2Surf will literally do anything. 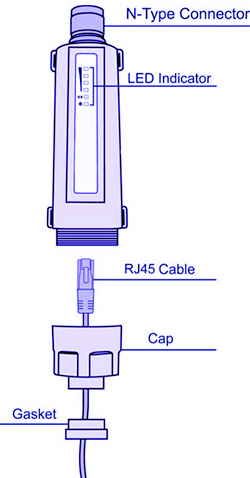 Can be utilized in Point-to-Point (PTP) bridging or Point-to-MultiPoint applications. Made to seamlessly bridge two locations, almost like you dug a trench and ran cable. Will perform virtually any wireless mode through firmware setup. Coming soon … Instant bridges, Repeaters, Client kits and more.. If you would like to use this radio for any function, please call us. We will set up a customized kit for you on the phone! There’s nothing lower cost on the market that will perform so many wireless functions inside one device! 11 Channels in US, or can be configured for international frequencies and power outputs. Virtually any wifi antenna can be connected to the top of the o2Surf. The gain will depend solely on the antenna connected to the top of the O2Surf. RF Power Output up to 800mw (28.5 dBm) Variable depending on operation mode. Highest power output 802.11B, Lowest power output 802.11 N. Software configurable from 3dBm up to 27 dBm. Available in 5.8GHz special order. N-Male connector on top, Standard CAT-5 Ethernet cable on bottom. Internet (WAN) Router / Access Point Mode – Can be used as direct Router for internet for any location. Can be hooked directly up to Cable modem, for full function, creating complete wireless router from broadband to remote bridge. Boosting the range of your home or business video security system and connecting long range remote cameras to your NVR or DVR. Boosting the range of your home WiFi router’s network and connecting to long distant WiFi Cameras spread out over your property. Print Server or remote PC Connection for any printer or device requiring network connections. Client Router Wireless Mode – This amazing new mode, allows our o2Surf, to connect to any WiFi Signal, public or private, regardless of the IP Address, treats the WiFi Connection as a public or private network, then starts providing DHCP (IP Addresses) out the Ethernet port, to create an entirely new private or public network. This amazing new wireless mode is simple to program and the o2Surf creates a complete wired / wireless network, providing internet or network connections to over 250 devices and handles all NAT traffic internally. This mode sets the bar for the newest generation of wireless devices and performs tasks that all other competitor’s wifi devices cannot achieve. Hundreds of o2Surfs can be used, tethered to any public access point, then act like your own router, creating a massive internal network on a completely new IP Address Mask. The possibilities of this mode are literally limitless. Connect to ANY public or private WiFi access point, then create your own personal, private network, supplying internet to your entire home. Connect to public wifi network, then issue IP addresses to as many internal devices as you wish. Connect to a remote wireless network system, then continue to add over 250 additional remote devices onto any network (bandwidth limited) creating virtually unlimited amount of data switches or network devices. Connect to a private access point, then allow another wifi access point to be created, controlling hundreds of remote low bandwidth devices to capture monitoring data to and from a control or command center. Perfect for providing data capture for power and utility companies to read meters or read water, power usage over widespread areas. Virtually unlimited possibilities for Wireless Internet Service provider use. The o2Surf, literally can perform ANY WiFi function. If you don’t exactly know what you want to do with WiFi and unsure what to buy to connect to the internet, or connect to a remote network, provide added wifi coverage around your home or ranch, or even create a HUGE wifi system for your entire farm or ranch, the o2Surf, and one of our large selections of WiFi Omni Directional Antennas, or Directional WiFi Antennas, allows you to literally perform any task. High Power output for longest range wireless signal possible. Very Sensitive Receiver – Capable of wireless exceptional wifi performance. Easily configured software – Can perform virtually any wifi function – Access point mode, Repeater mode, Client/Bridge mode. Simple software and easy setup modes for easy step by step configuration. Simple, step by step instructions to make the O2Surf operate in any wifi mode, quickly and easily.